Townsville Mayor Jenny Hill’s alleged lack of success in bringing new infrastructure projects to the city may become a major issue in the mayoral election in March next year, based on a report in today’s Townsville Bulletin. The Mayor may be vulnerable on this issue, given how long it has taken so far to progress the Super Stadium, which still has not obtained the Commonwealth funding commitment it needs. She will also be vulnerable because of the relatively weak Townsville economy recently, although it appears the unemployment rate is thankfully coming down a bit. 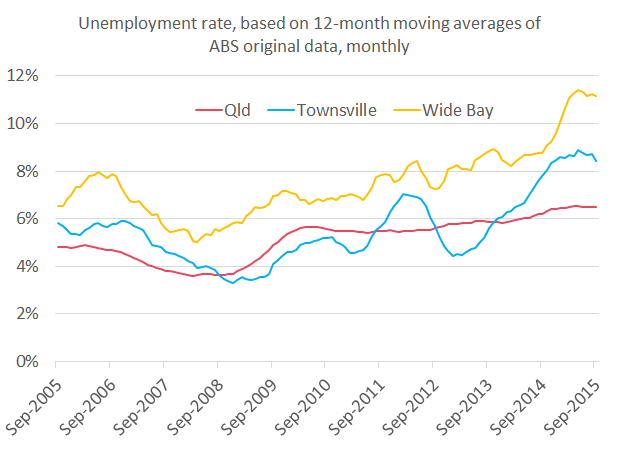 The Townsville region, like other Queensland regions, such as Wide Bay (see chart above), has struggled in recent years, and as I’ve noted before, net employment growth in Queensland is confined to the South-East, and the regions as a whole have been losing jobs. It is no surprise the mining regions are struggling (chart below), but it is not only them, as I have noted above. 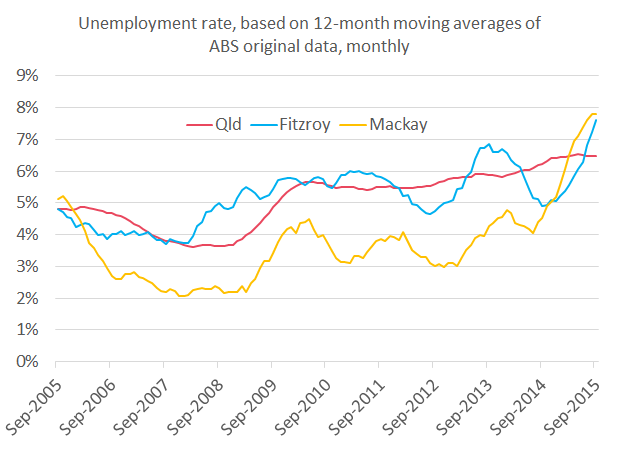 To give another example, Cairns is also a worry (see Pete Faulkner’s post Regional labour market data shows Cairns sliding badly). “According to the survey, business confidence in Queensland was the equal highest in the nation, along with New South Wales. Let us hope the Treasurer’s optimism is justified. I remain concerned about the outlook for the national and State economies given the risk of weak business investment over the coming twelve months and the risk of a severe downturn in China. For further information on the regional labour force data, see the Queensland Treasury’s latest regional labour force brief. This entry was posted in Labour market, Macroeconomy and tagged capex, china, fitzroy, investment, mackay, qld, queensland, superstadium, townsville, unemployment, widebay. Bookmark the permalink. Gene, good points about Townsville and the mayor. The stadium is a perfect example of not been able to produce a credible plan to gain the support needed. The state Govt have funds ready to go for the stadium but now the mayor is putting the stadium in with a convention centre and waterfront developement and the stadium is getting bogged down in the process. The mayor lead a delegation down to Canberra with no plans for the stadium, associated public transport, no budgets, no timelines, just a couple of drawings and an animated flyover, embarrassing really. As your story highlights the economy up here is struggling and these projects need to be expedited. Thanks for the comment, Glen. Yes, that is embarrassing.